Though the works of Homer are very old, they have been remarkably well-preserved — especially if you consider the fragmented state of Sappho, or the lost plays of Sophocles. The two great poems were perhaps written down three thousand years ago, this after generations (many generations) of oral performance; Sophocles would have considered Homer ancient. So there is the integrity of the text, which we have received in far better condition than many plays by Shakespeare or even the Ulysses of James Joyce. But there is also the integrity of the poem, the wholeness or thoroughness with which it was conceived. Religion, too, is integral to the story, the sacrifices and supplications, the many occasions when a god appears (at any time and in any form) to shape the ways of mankind. The sacred is never far to find in Homer, but just as regularly we find details of attire and weaponry and strategy: all of this serves the fundamental humanity of the whole: the integrity of character. Iliad, Book X, (Night Action). The story so far? 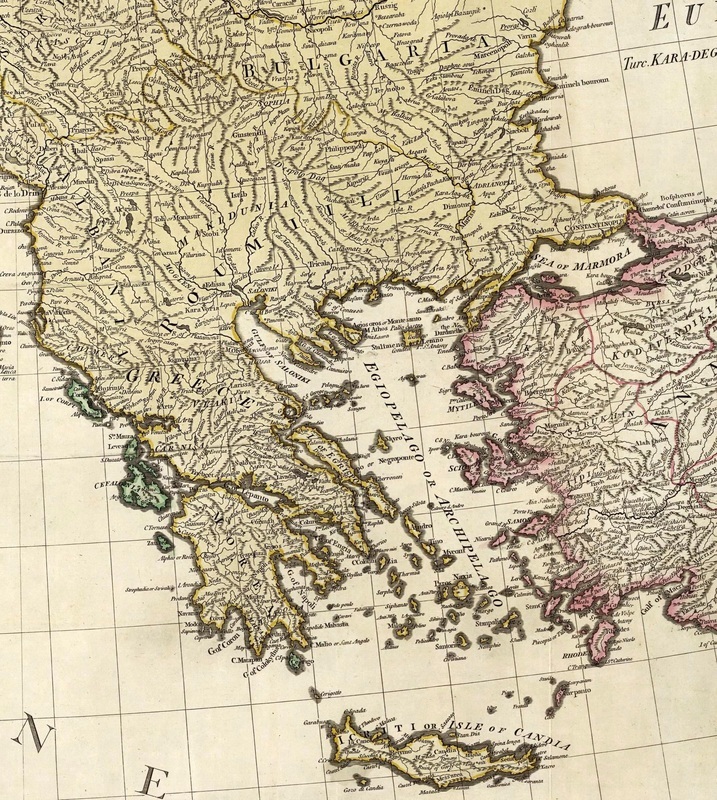 The Greeks have suffered a severe defeat and have been beaten back to the shore. Night falls, and the Trojans retire. Some hours later, we are brought to Agamemnon's tent, where we are presented with a familiar scene: the troubled sleep of the monarch. 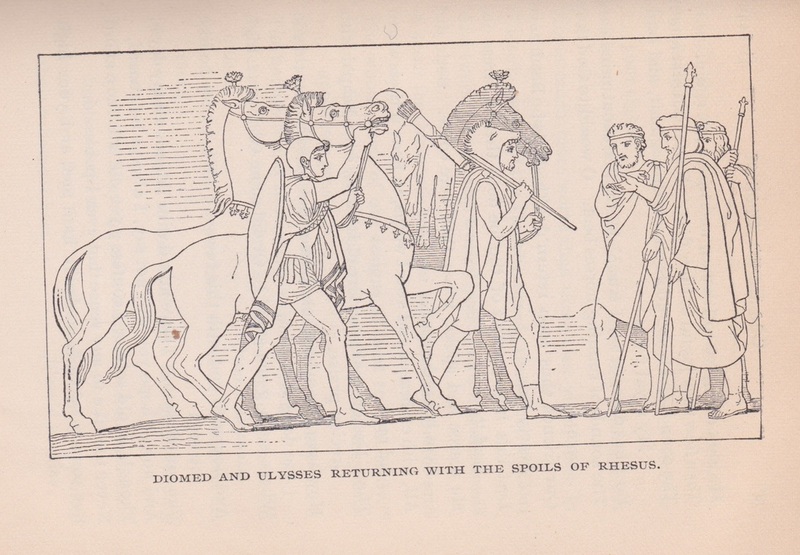 There's nothing new in saying that Homer, throughout the Iliad, cannot be accused of flattering the Greek invaders. Within the Iliad, we will see Agamemnon reveal his more boarish characteristics, and we know his past, and his (limited) future. His stubborn greed created the primary situation around which the Iliad revolves: the sullen anger of Akhilleus; still, though the wee hours of the morning, Agamemnon is shown in a good light. Our knowledge of the span of Agamemnon's career is not the advantage of a XXI century perspective: it was known to the first respondents, so that the slightest phrase might evoke "the rest of the story." The underlying tragedy of the Iliad is not simply the protracted and pointless war, nor the sulking Akhilleus, but also an end of an era. This is the end of the age of Heroes, and the Odyssey is the last stand of the hero. We are frequently reminded that Menalaos has red hair, the full significance of which may be difficult to recapture yet it seems much more than a descriptive note. A number of unflattering characteristics are attributed to redheads: unlicensed sexuality, treachery (Judas), hot temper. Pound suggested that it was seen as an invitation to be cuckolded (Letters, #294). On his behalf, the Akhaian army travelled across the sea and fought the Trojans (the war lasted something like 4000 days; the Iliad covers about 40); he is among the few to return safely home. That with the fix'd ends of the tusks his head might not be ras'd. When he laid waste Amyntor's house, that was Ormenus' son. Molus to his son Merion did make it his bequest. With this Ulysses arm'd his head . . .
Odysseus dons his grandfather's headpiece. Here, in an aside that might escape notice, we see the etiquette of hospitality ("as present of a guest") the violation of which by Paris led to ten years war. This scene takes place in the chilly hours before dawn. We are informed how each of our heroes dresses: Agamemnon throws a lionskin ("dangling to his heels") around his shoulders, Menalaos wears a leopardskin. Nestor's red mantle is lined with fleece. Diomedes also chooses a lionskin for a cloak; Odysseus, however, only picks "a painted shield to hang from his broad shoulders." I do not think this is Homer's carelessness but a character detail. 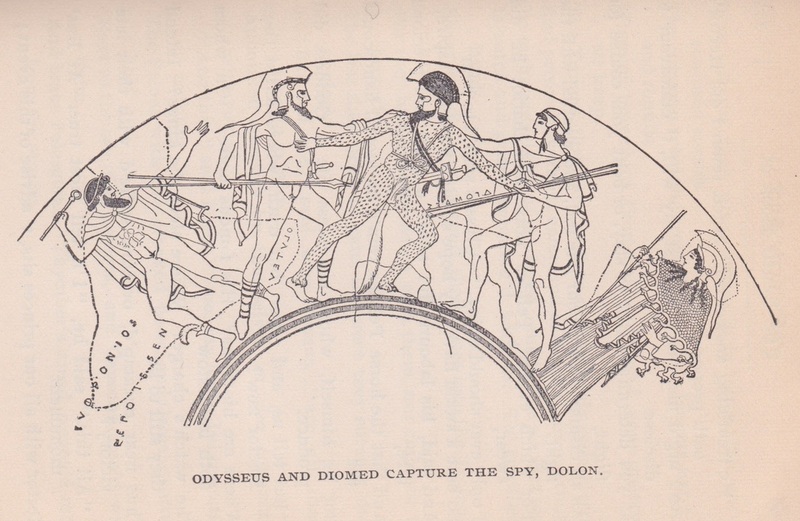 Odysseus is nothing if not cool.